The papers for bestowal one should always read between the lines. Their terse military style lines are not supposed to express excessive emotions. The bestowal papers of Hero of Russia Colonel Belyavskiy says "thanks to his courage and heroism only showed in the engagements with outnumbered elements, the detachment under his command dispatched combat missions without heavy battle casualties”. 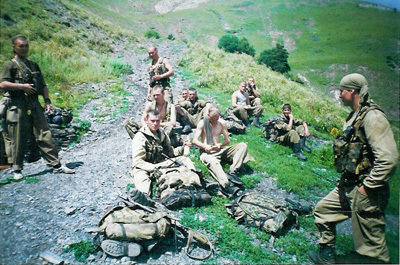 In that gorge in Chechen Mountains a unit of Caspian marines run into a professionally laid ambush. The snow stained with blood of six “black berets”. Everything form the tactical standpoint was for them to die that time. 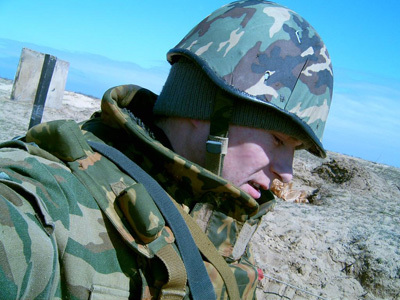 Those days and nights of late February 2003 the luck of commander, steel nerves of Belyavskiy that time Lieutenant Colonel yet, and fighting spirit of all who helped the beset marines saved scores of lives. The careers of military men are similar. Almost all the time you can meet familiar face. It appeared that we met with the today Deputy Commander of Moscow-Chernigov, Red Banner, Order of Suvorov 2nd class Marine Brigade of the Guards of the Caspian Flotilla Colonel Vladimir Belyavskiy yet in Sevastopol. There in the Black Sea Marine Regiment he made his way to the commander of reconnaissance battalion and had indisputable authority with his comrades-in-arms. One of the episodes in battalion commander’s statement of service can be referred to as nothing but unique. 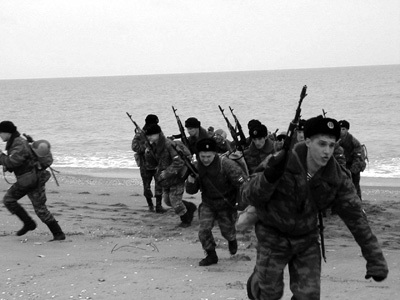 The historians are yet to give an estimation to the events of October 1993 developed off the coast of Abkhazia. Several years of undeclared war had taken lives of over 20 thousand people. Hundreds of thousand people found themselves castaways at their own homeland. The rise to power of Edward Shewarnadze in Georgia the long-suffering land got a tiny bit of hope to get rid of hostilities between Abkhazians and Georgians, and if not to labor for peace then at least to stop killing each other. The war felt at home that time at once blessed land of ancient Colchis. The returning train of Georgian president in the area of Kodor gorge was attacked by armed band of unknown nationality. Already later the Georgians attributed the attack to Abkhazia. The latter did not left a favor unanswered referring to a “juicy detail” that Shevarnadze had a lot more enemies in Georgia then in Abkhazia. The situation required immediate response. A company of Russian peacekeeping troopers immediately advanced to the aid of the president and arrived hotfoot on the battlefield. Helicopters from Tbilisi gained some precious moments to evacuate Edward Shevarnadze and his party. The troopers fought hard and eventually were driven to the river bank by outnumbered enemy. It seemed only a miracle could help them. The more so the elements tried to avenge the troopers after such an important bird had flown. But hundreds kilometers away from the battle site the pattern of withdrawal was already set up. That time at saline lake Donuzlav in the north-west of Crimea the Russian Navy had a modern naval base with a division of amphibious air-cushion landing crafts. The best in the division was considered amphibious ship of Zubr (Bison) type under command of experienced and resolute officer Sergei Kremenchutskiy. Upon receiving orders the dashing Zubr headed for Sevastopol where picked up marines under command of senior lieutenant Belyavskiy. The speed was nothing but fantastic - up to 60 knots, about 100 kilometers per hour. Several hours were enough to cross almost half of the Black Sea. In pitch black night they reached the shore and established communication with our peacekeepers. The roar of ship's turbines confused the enemy. They thought aircrafts coming from the sea side and set screen fire against air targets. The tracers of AA guns and heavy machine guns colored the air above Zubr. This all played us into the hands. The surprise was added by supreme level of training of ship’s crew and marines along with the capabilities of the ship herself flying above the wave ridges. At maximum speed Zubr rushed to the shore. The marines under senior lieutenant Belyavskiy acted perfectly in a flash-like manner. The troopers were saved. That time Belyavskiy stayed without awards, but that was not the priority. Later an armed hydrofoil vessel from the nearest port would hurry to intercept Zubr. That time commander Sergei Kremenchutskiy would decide to fire for effect from shipboard Groza rocket launcher the one that is similar to multi rocket launcher Grad. The gunners did not fail and the enemy was hit by a number of deadly missiles. It is impossible to overvalue the actions of those late October days off the Caucasian coast. A handful of reckless Russian marines, troopers, and skillful crew of amphibious ship managed to change the course of developments in that war-worn region. Ten years later during the “Revolution of Roses" in Georgia hardly anyone there would keep good memories of Edward Shevarnadze whose presidential government stopped the war. In a month time Vladimir would return in that region again. The saved president asked for Russian help in order to stop the civil war. The marines of the Black Sea Fleet landed in the area of Poti. Yet three years before this was a place favored by nature. That day the top dog of the place were the breakdown and people with arms. However those “national” forces with bandit nature were soon smoked as the “striped devils” are not to be trifled with. The common people had a sigh of relief because the plundering and looting finally came to a stop. Now after so many years of life and service behind, Vladimir Anatolievich often catch himself at thinking on how his life is closely linked to Caucasus region that is far from being calm. In January 1995 when our troops were crawled in Grozny’s snow soaked in blood Belyavskiy together with his marines was making ready to be sent to Chechnya. That time in order to practice fighting in a built-up area Black Sea marines adapted undeveloped block of flats for these purposes not far from the base. That time president of Ukraine Leonid Kutchma gave a call to the Black Sea Fleet Commander-in-Chief Admiral Edward Baltin in order to remind that the Black Sea Fleet in accordance with international agreements is subject to take part in armed hostilities at Caucasus under no circumstances. It was hard and painful to watch TV news that relished the number of Russian soldiers killed in action. Vladimir was sure the guys from the company he rescued before were there that time. The outbreak of the second campaign in Chechnya found Belyavskiy in the Academy. His former subordinates, company and platoon commanders Vadim Klimenko, Vladimir Karpushenko, Denis Ermishko along with tens of other fellow soldiers advanced to the regions where the blazes of war appeared again. Lieutenant Vladimir Karpushenko Hero of Russia after the Academy returned to his home regiment. Black Sea Fleet Marines had a glorious reconnaissance battalion that gave motherland two Heroes of Russia and tens of marines decorated with orders and medals. The Fate and Manpower Office found other station for Belyavskiy, Caspian Flotilla to be exact. The ambush was laid perfectly like a kill zone. At the turn of the slopes at the highest points of the ridge the elements set three firing positions with one to the right of the marines’ path and two to the left. The firing sectors from these positions built up isosceles triangle with every spot could be swept from all quarters. It is clear now should commander have sent at least handful of soldiers uphill the outcome would result in exchange of several strings of bursts. The elements would have simply fled. When an ambush is uncovered it looses any meaning. But everything went just opposite. As soon as the marines reached the center of that death triangular they were set under massed intense fire of heavy machine guns. The guys pinned down by fire attempted to set all-round defense. But the same slope that was of so many obstacles on the move now saved their lives. In only several minutes the major part of the unit slipped downhill to the very bottom of the gorge to the shadow zone. 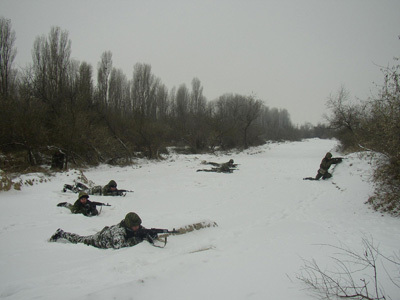 Some marines retreated to the jaws of the gorge, to the command center where Lieutenant Colonel Belyavskiy controlled the operation. It is getting dark quickly in the mountains. As for the late February it is twilight domain at 4 p.m. already. The whole night for the elements who knew the slopes like the palm of their hand was more than enough to finish cut off marines. After brief conversations with the command Belyavskiy takes a decision to rescue the encircled squad. He felt safe for the secrecy of the radio traffic. The old radio communications set P-159 was equipped with such coding device that no matter how you carefully you listen in, it would take years to decipher the transmission. As an experience reconnoiter Vladimir led his unit on the very top of the ridge. No matter it was hard but for sure much more safe. God only knows how they managed to travel directly into the encircled squad the only explanation was Belyavskiy’s many years' experience in the mountains. The joy was unutterable. But the real tests were yet to come. Long afterwards those of the first squad were asked why not a single pistol-flare-light was shot. The answer was somehow discouraging. “Did not want to disclose ourselves.” As if the elements keeping the beads on them from all sides were not aware of their position below. The night made it possible to escape from the kill zone. But there were yet three days of murderous fighting ahead before they reached safety. They suddenly fall with the elements. The latter met them with Allah Akbar shouts. Vladimir immediately realized the spirit of his guys, the moral fall. But it was quite natural. And then the situation developed like in comedy military films – Belyavskiy shouted "First squad to the right, third platoon cut them behind!” He kept enough sense not to command imaginary assault battalion to parachute on the heads of the enemies. The elements were thrown into confusion meaning their scouting was far from perfect as well. Our guys recovered themselves a little and passed an order to organize all-round defense and opened fire. They were so lucky to shot two Chechen snipers. Later when the day broke our sniper was surprised founding the barrel of his rifle shot through by a Chechen bullet right in the middle. Liutenant Sergei Verov and two other marines were ordered to advance in order to scout the path. A burst of a mine peppered all three of them by the frags. Screams, moans. Lieutenant Colonel cried platoon commander Lieutenant Konstantin Lyahov to grab the guys and move on all fours to recover the wounded. Verov in spite of his leg wound shot back to the last round. A bullet hit him when Konstantin was only several meters away from him. The second wounded marine was recovered in the dark. As for the third he became silent bleeding to death and stayed on the snow till dawn. At the first light the fight come up with a bang. From Zinkala settlement grenade machine gun opened fire. Machine-gun crew was lost. Artillerymen of nearby 205th Brigade opened fire. The real grief came to the marines during the day when the wounded started dying... The explanation was simple not everybody could endure the whole night on the snow with loss of blood and pain shock. Soon the time came to organize a pad for helicopters landing. The spot was found quite promptly at the confluence of two frozen mountain rivers. The helicopters made the first approach, fired several free flight rockets at elements’ positions and made a landing. The first two machines received the wounded. They took off and got away without a single shot from the elements. Vladimir with the rest of marines boarded the third helicopter and when they got aloft he even gave a sigh of relief. A sudden burst broke the flight. The copter fall right in the forest but the bushes and tops of the scrubby mountain trees cushioned the fall. Luckily, everybody survived but the pilots were seriously injured. The marines jumped out of the copter in the twinkle of an eye. One of the copter’s crew cried that forgot his weapon on board. Later Belyavskiy considered his order for him to return and recover the weapon as the only mistake in the whole action as he jeopardized lieutenant's life to no purpose. Senior lieutenant managed to get his Kalashnikov from the twisted wreckage of MI-8 seconds before it got ablaze. Local rebels and mercenaries got informed of the crash immediately. From all neighboring bases and settlements the elements surged to the crash site. The amount of bounty for the head of a pilot either dead or alive could reach several thousand dollars. Radio intercept revealed operation of a hundred radio transmitters therefore the number of elements could get to five hundred even at rough estimate. And again the back-breaking race on the slopes started. At some point the pilots offered to return to the crash site in order to wait for the rescue party. The marines even had some fun about it as they had been already “rescued” once. The elements sit still while being bombarded by artillery and shot by helicopters. But as the copters land the shelling is ceased. And that is the moment when “highlanders’ feast" starts. An officer of the helicopter crew was completely tired out and sat right in the middle of mountain trail begging to leave him there. The marines not saying a word took him by the arms and carried out of action. “Listen, you are not the master of your life here in the moment of impotence. You die and the elements during their feasts dancing, drinking vodka, and eating shashlik would be boasting as if they captured "black beret" alive. And then your head would hang loose somewhere on our path as an evidence of enemy’s victory. You’re one of us, an integral part of our rather battered in here “stripped soul”. If you die, death will come in our hearts as well. Stick it, and stick it one more time flyboy, you are now one of mountain marines!” The time would come and the fellow would do his job splendid and send his death greetings to the enemy from a copter. Along the gorge they moved on two slopes in full silence. By night they reached positions of assault regiment. Colonel Alexander Kovalenko who was in charge there appeared to be Belyavskiy’s friend and classmate, his battalion was urgently redeployed to the gorge jaws to assist the marines. It was time to rejoice but everybody was deadly tired. The troopers shared their bag dinners with the marines. The next morning revealed other “war losses". After three days of continuous fights the fellows were so tight asleep that did not feel as frostbite their legs. As the last marine left the gorge the elements were engaged right by the military textbooks. And again thanks to radio intercept it was found out that the losses of the elements amounted to about forty men. Up to a hundred “Islamic warriors” were severely wounded. False started reconnaissance made it possible to gudgeon and expose to heavy artillery and aviation up to five hundred elements that eventually turned out to be a great success. Single timely decision, officer’s will and military skills of Colonel Vladimir Belyavskiy weighted the scales on our behalf. Many years ago a poet Nikolay Gumilev said in his Cavalryman’s Sketch-Book: “There are people born solely for war and in Russia their number is no lees that in what place soever. And in case they can not find their employment in “civil life of the Northern Power”, then they are irreplaceable in country’s ”military fortune”. And the poet knew it was always all the same.” The born officer Colonel Vladimir Belyavskiy is on of those warriors of Russia who represents its power and the glory. Along the gorge they moved on two slopes in full silence. By night they reached positions of assault regiment. Colonel Alexander Kovalenko who was in charge there appeared to be Belyavskiy’s friend and classmate, his battalion was urgently redeployed to the gorge jaws to assist the marines. It was time to rejoice but everybody was deadly tired. The troopers shared their bag dinners with the marines. The next morning revealed other “war losses". After three days of continuous fights the fellows were so tight asleep that did not feel as frostbite their legs. As the last marine left the gorge the elements were engaged right by the military textbooks. And again thanks to radio intercept it was found out that the losses of the elements amounted to about forty men. Up to a hundred “Islamic warriors” were severely wounded. False started reconnaissance made it possible to gudgeon and expose to heavy artillery and aviation up to five hundred elements that eventually turned out to be a great success. Single timely decision, officer’s will and military skills of Colonel Vladimir Belyavskiy weighted the scales on our behalf.Many years ago a poet Nikolay Gumilev said in his :“There are people born solely for war and in Russia their number is no lees that in what place soever. And in case they can not find their employment in “civil life of the Northern Power”, then they are irreplaceable in country’s ”military fortune”. And the poet knew it was always all the same.” The born officer Colonel Vladimir Belyavskiy is on of those warriors of Russia who represents its power and the glory.